random opportunities, we’re constantly loading a moving van. I’m about to do it for the second time in two years, and my back already hurts. Every time we make a move—whether across the country or across town—a shocking reality hits us: we have way too much crap and it needs to be dealt with. But at the end of the day, there are really only three things to do with our stuff: We can store it, trash it, or sell it. During school, most people had an apartment or dorm room full of stuff, the majority of which will be taken to your first post-college digs. This means you're left with the unenviable task of storing all your worldly possessions during the post-college summer: anywhere between a week to several months. Aside from the obvious step of asking your parents, a good place to start is with former and future landlords. Assuming you were a reasonably good tenant, many landlords will cut a little slack with the removal of belongings, or they may rent you a garage or storage space at a handsome discount. Likewise, if you’ve signed a lease to the perfect apartment, but the move-in date isn’t for a couple weeks, a kind landlord may find some space for you to stash some stuff. If your parents coldly shoot you down when you show up with a trailer full of furniture, look beyond the immediate fam. Fifty bucks a month can go a long way in diffusing an awkward situation. Friends and co-workers may be willing to rent out a portion of their garage if they know it’s only going to be for a few weeks. Renting a self-storage space should be seen as a last resort (and a sign it’s probably time to trash and sell). A number of factors go into selecting a space, including size, location, security, and access times (some are 24/7; others can be 8am-8pm). If you’re going to be visiting your space every couple of days, location should be the determining factor. If visits will only be a yearly occurrence, shop around and find the best deal, even if it’s well out of town. Keep in mind that you are always entitled to a free storage quote to help weigh you options. And be wary—it’s common to see signs touting “$1 for the first month’s rent,” but such deals usually require a one-year contract. Once you settle on where to put your stuff, remember to consider how to package it. Believe it or not, there’s actually a right way and a wrong way to store stuff. Following these tips will help you avoid returning to a garage of moldy and broken possessions. Yes, we all love our stuff, but hey, money is nice, too. So if you think you can part with some of your more useful items (or even not so useful ones that someone else wants), you should start classifying your possessions into categories and putting them on the market. A little prep work will ensure the best return for your sacrifice. It seems like the clothing you never wear has a way of multiplying and then taking up valuable closet space. This is unacceptable. When you decide to move, it is time to part with those crowding garments and make way for new pretty, hole-free apparel. Buffalo Exchange is a used clothing store that will pay cold hard cash for used clothing in good condition. Want to update the old wardrobe? Taking store credit in lieu of cash will get you a better return on old jeans, halter-tops, and booty shorts. Many independent used clothing stores operate under the same basic premise as Buffalo Exchange. Due to their smaller scale, they probably won’t be able to compensate as well, but they’re definitely a viable option. Finally, if you’re feeling generous, the Salvation Army is always an option. I am constantly blown away by Craigslist. Whatever you need, whether it’s a place to live, a new bicycle, or spiritual salvation, you can find it on Craigslist. Of all the things that are posted on this incredible site, nothing makes more sense than furniture. Getting someone's used couch or mattress might seem a little unsavory to some, but there’s no way you want to ship an armoire across the country. Because of Craigslist’s local search radius, shipping is never an issue. Along the same lines, Facebook now has a classifieds section – perfect for in-town transactions. Furniture Trader is another viable option for unloading that clunky coffee table. It definitely gets far less traffic than Craigslist, but a quality listing at Furniture Trader will stand out. Attempting to unload all your belongings on Craigslist can easily become a full-time job. So those with a dearth of free time (or an aversion to meeting people in the market for a used hookah) should become well acquainted with consignment shops. A consignment shop is essentially a store that will sell your stuff and keep a percentage of the sale price. There are even consignment stores for Craigslist and eBay. And all you have to do is drop off your junk, and they sell it for you (a la 40-Year-Old Virgin). When selling books and CDs you have two main options—in store or over the Internet. Most used book stores will purchase books that are likely to sell in a rapid fashion. And music stores with large used sections—Rasputin and Amoeba, for instance—operate in just the same manner. These establishments are becoming less and less common, so take advantage of them while you can. And note: if you are in the market for some new tunes or literature, the “store credit rule” definitely applies here as well. Don’t feel like leaving the house and dealing with the weirdos that work at used music and book stores? Cruise on over to Amazon. There are used versions of nearly every book and CD on the site. It’s far easier to unload those niche and specialty items here than at a local store. Secondspin and Cashforcds.com are two sites that will buy used CDs and DVDs. And Half.com is a great option for selling those textbooks you’re finally ready to get rid of. Because electronics become obsolete so quickly, they can be difficult to sell. Craigslist and eBay are probably your best bets here. This being said, there are a couple of exceptions: cell phones and video game systems. Half.com is great for selling video games and game systems, and sites like Sellyourcell.com and Phoneiscash.com make it easy to unload an old cell phone. You can even unload an antiquated cell phone plan on several sites, including Cellswapper.com. Finally, EB Games and GameStop are two stores found across the country that will buy anything related to video games. There is just some stuff that’s not worth tricking someone into buying, and it's certainly not worth holding onto. Fortunately, most of your worldly possessions don’t have to end up in the dumpster. An easy way to get rid of your stuff (and feel good about yourselves) is by donating your unwanted belongings. Charitable organizations like Goodwill are a great place to start. Homeless shelters, frat houses (maybe not so “feelgood”), and certain departments on campus could always use more furniture. Even broken electronics can be recycled (often for money). And unlike broken refrigerators and decomposing mattresses, some large items still have some value. 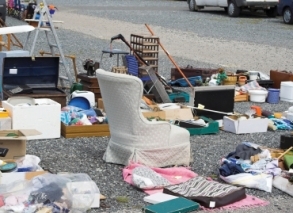 The Salvation Army will save you the trip to the dump by coming to your apartment and picking up couches, dining tables, and anything else they may be able to sell in one of their thrift stores—free of charge. Plus, in addition to the “high on life” feeling you’ll get from donating your goods to charity, there are tax benefits to your generous actions. Just be sure to get a receipt. And learn to do your taxes. Take broken water heaters, air conditioners, kitchen appliances, and clothes washers and dryers to the dump, or wait for a neighborhood cleanup day, when they can be picked up free of charge. Cities usually charge a small fee for special pick-ups, but $10 is a small price to pay to have that refrigerator hauled away, without any harm to your back. Contact your town’s city hall for more information. Keep in mind that moving can be an opportunity to reorganize and simplify. Try not to get too sentimental. Material goods aren’t nearly as important as you think they are, and most can be replaced in the future without much hassle. So embrace the freedom that comes with a nice possession-reduction and get ready for a new home, nicer things, and a life free of clutter (kinda…). I can personally say I got rid of a ton of stuff when I graduated and I don't miss any of it - in a month or two you won't remember what you trashed...except for maybe the foosball table...I do miss that - it was more a part of me than just a piece of furniture.